How true are these words for a WordPress website! Every day you would hear a new story about a WordPress website being hacked which is sure to shake you up if you own one yourself. The best way to combat this fear is by ensuring that your website is secure through proper measures. Here are a few preventive ways that would ensure your WordPress website doesn’t fall prey to any malicious activities! And if nothing seems to work out, hiring a WordPress developer is never a bad idea. Isn’t it irksome to find spammers ruining the flow of online traffic to your website? Well, WordPress anti-spam plugins and WordPress developers are the exact solutions to this irksome feeling. The WordPress bloggers would be extremely familiar and agreeable with the above query. You generally cannot cherish the moments when you see a huge traffic being directed to your website because the very next moment, you would end up finding numerous spamming comments plaguing your blog or site. Not anymore! If you are a website owner or you are planning to set up your own website in WordPress, make it a point to interrogate your WordPress developer about the possible solutions to defend your website from those obnoxious automated spamming bots. Or else, take the command in your hands and ask your developer to install one of the top WordPress anti-spam plugins on your website. Yes, we got them compiled for you, thank us later! Is your site on the verge of losing data? Well, it might happen anytime to you and that too without prior warning. So what steps are you bringing into action to deal with this? You cannot afford your website to be down for even a few moments, right? The data that you put up and store on WordPress can be lost anytime. Hence, you need to protect it at all costs. Fortunately, there are plenty of plugins available that would backup your pages, blog posts, photos, product descriptions and whatsoever is present on your WordPress website. Which WordPress plugins are the best? Which one should you choose? Well, you would have to keep reading this article to find out. With the progress of technology, digital marketing and blogging have really been on the rise. The need of the hour is an efficient content management system that can cater to the rising demands and meet the certain expectations like having an easy-to-operate user interface, proper blog section for easy blogging, non-technical HTML-free editing throughout the website etc. This is where WordPress comes in and answers all our prayers by providing a unique and hands-on user interface, an in-built blog section for easy blogging and providing a HTML-free editing as demanded! More than a quarter of the web now depends on the services and platform of WordPress. This is how swiftly and quickly this service has risen in demands and functions over the last few years. Today as many as 74.6 million sites are proudly powered by WordPress. And what makes WordPress such an ever growing platform? Perhaps the number of plugins it boosts. There are more than 29,000 WordPress plugins available today, and a new plugin gets added almost every hour. With such a huge popularity that WordPress has, it is only obvious that people are now inquiring more about the WordPress eCommerce solutions. The trend to sell online is up, and since the people have good experience with WordPress, they want to use WordPress as their eCommerce solution too. WordPress started out as a bloggers paradise, it stayed and evolved as one of the best stops for bloggers for years, and has now slowly and steadily enticed the business bigwigs to sell their products through it. And why not, its accessibility and user interface is much more easy and interactive than its many competitors. Moreover, its hands-on services are like no one out there! All you would need to do is get yourself some bang on plugins and you are on! And if this seems like a big task to you, simply hire a WordPress developer. What these plugins are, really? Let us check out the best ones. WordPress is eminent blogging software granting its exceptional services for more than a decade. It was started in the year 2003 and has been continually providing services since then. However, from the last few years, it has been granting impeccable content management services to the non-blogging websites too. 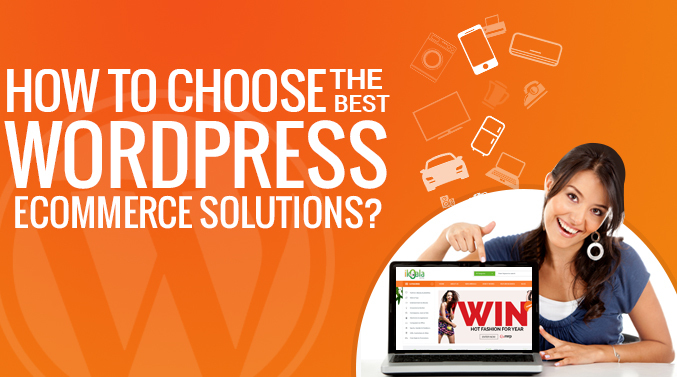 WordPress has not gained such popularity out of pure luck but due to its exceptional benefits. Here are the top reasons why using WordPress for your website content management is beneficial over the use of other content management software. You may begin to think about switching to WordPress after knowing its bountiful benefits.